Here’s a general guide to warning signs of foundation issues. Before attempting repair – or making a decision whether or not to purchase a home – get onsite advice from a qualified building inspector, engineer, or concrete pro. Cracking is the most obvious red flag. 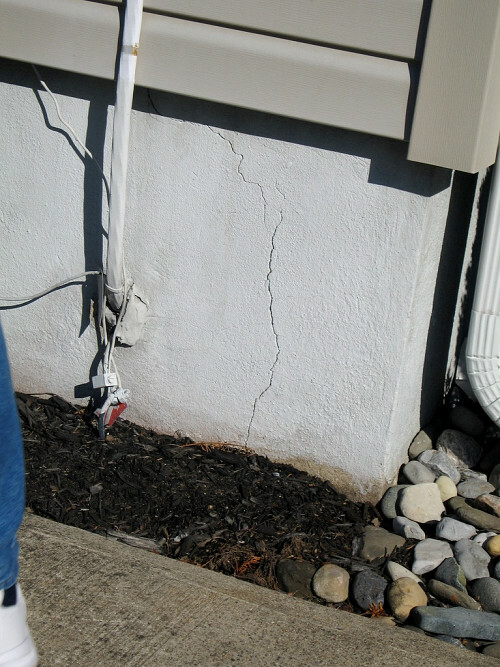 While a foundation crack can be relatively minor, a result of the concrete curing process, home improvement guru Mike Holmes recommends professional inspection of any cracks wide enough to insert the edge of a dime (about 1/16”). If you’re unsure how serious these signs of foundation issues are, take a photo or stick a strip of tape at either end; check back in a few weeks to see whether they’ve grown. Diagonal crack. “Stair step” cracking in a cinder block or brick foundation wall can warn that the structure is in danger of collapsing, especially when the cracks appear near the corners. When the masonry itself is crumbling, find emergency professional repair. Uneven, warped, or sagging floors. Doors and windows that are suddenly hard to open or close. Trim that is separating at its corners. Damp, musty air. Sometimes, you won’t see actual puddles but you’ll still get some very good clues that there is too much moisture around your foundation --- usually via damp, musty-smelling indoor air or mold growth. Before buying a home, read the seller’s disclosure, which reveals any known latent threats to your health and safety as a future resident. This includes previous foundation problems, such as flooding or mold. Any completed mitigation should be documented in writing. Also, as a potential buyer, have the house checked by a qualified building inspector, who should look at both the exterior and the interior of the foundation. Beware a basement crammed with boxes; they may be hiding signs of foundation issues. Don’t expect your inspector to investigate behind them; moving furniture or other items is not his job. Find out your local requirements for residential foundation repair. You (or your contractor) may need to pull a permit and/or arrange for an engineer’s report. Foundation repair may be as simple as filling a crack with epoxy. However in complex cases, you may need more extensive work, such as installing French drains or reconstructing the foundation. Whatever repair is done, ensure that the issue is resolved at its source.